Overview: MGL is a city gas distribution firm that has the sole distribution rights for CNG and PNG supplies in and around Mumbai. It is a JV between GAIL and the British Gas of U.K.
MGL had revenues of Rs 2,121 cr. and profits of Rs 309 cr. in FY16. MGL’s revenue, EBITDA and PAT have grown 12.4%, 1.8% and 0.1% CAGR over 5 years. MGL has a good balance sheet, low debt, high cash and a high dividend yield. MGL supplies CNG to over 4.7 lakh vehicles through a network of 188 CNG filling stations, and PNG to 8.6 lakh households, 2,866 commercial and 60 industrial consumers. With global gas prices falling, demand for gas is expected to rise. MGL is growing pipeline networks. It is available at attractive valuations. Based on the adjusted FY16 EPS, the asking PE stands at 13.47 which is lower than listed peers. Opinion: The Mahanagar Gas IPO is rated a BUY with a 2 year perspective. IPO opens: 21-23rd June 2016 with Issue Price band: Rs. 380-Rs. 421 per share. Shares offered to public: 2.46 cr. of Face Value: Rs. 10 per share, Market Lot is multiples of 35. Shares offered are 25% of post equity. Promoter holding will fall from 90% to 65%. The IPO is of Rs 1,040 cr. which is a sale by current shareholders; there is no fresh issue of shares. MGL is a JV between promoters GAIL and British Gas Asia Pacific Holdings (BGAS) where each owns 45% stake. Govt. of Maharashtra holds an additional 10%. Through the IPO, promoters would offload a stake of 12.5% each. The IPO helps MGL meet the 25% public holding norm. The offering is available to institutional, non-institutional and retail in ratio of 50:15:35 of the offer. MGL is a city gas distribution (CGD) firm that supplies natural gas in Mumbai and surrounding areas. It is the sole distributor in Mumbai. MGL is a JV between GAIL and the British Gas of U.K. For abbreviations full form or glossary, see last page. MGL had revenues and profits of Rs 2,121 crores and Rs 309 cr. resp. in FY16. The firm distributes and sells natural gas, moving it from suppliers to end consumers. It distributes CNG for use in vehicles and PNG for domestic households, commercial and industrial use. In FY16, MGL supplied CNG to over 4.7 lakh vehicles through a network of 188 CNG filling stations. It also provided PNG connection to 8.6 lakh domestic households, 2,866 commercial and 60 industrial consumers in Mumbai and adjoining areas. For FY16, their CNG and PNG businesses accounted for 71% and 29%, of their total gas revenue. And 23.1% of the total CNG sales were to retail customers through company owned/ franchised outlets and 76.9% of CNG sales were through Oil Marketing Cos. and State Transport Units. See Fig 1. MGL has a supply network of 4,646 km of pipelines, with 4,231 km polyethylene and 415 km steel. Ashutosh Karnatak is Chairman; Rajeev Mathur is MD of MGL. In FY16, they had 499 employees. MGL has the exclusive authorization (Infrastructure Exclusivity) to lay, build, expand and operate the CGD network in Mumbai until 2020, its adjoining areas until 2030 and the Raigad district until 2040. BGAS (British Gas Asia Pacific Holdings) is a subsidiary of BG Group UK, which in turn is a subsidiary of Royal Dutch Shell plc. Shell is one of the world’s largest independent oil and gas firms. In 2016, Shell had cash flow from operations of $30 billion. The Shell Group develops crude oil and natural gas supplies from major fields. Natural gas based liquefied natural gas (LNG) is shipped to markets around the world. The Shell Group’s portfolio of refineries and chemical plants enables it to add value to the oil and gas, turning them into a range of refined and petrochem products, which have domestic, industrial and transport uses. GAIL (India) Ltd. is the largest state-owned natural gas processing and distribution firm in India. The company has 80% market share in natural gas transmission. It possesses about 11,000 km of gas pipeline network with a capacity of 210 mmscmd. It has presence in Egypt and China through city gas projects and in Myanmar through E&P. It acquired shale gas assets in USA through US subsidiary GAIL Global (USA) Inc.
Income has grown at 5.6% CAGR over the last 5 years Fig 3. In the same duration, EBITDA and PAT witnessed a fall of -6.5% and -17.4% CAGR. P/E ratio has however risen to 19.6 times. GAIL has low net profit margin of 5.2% and a 80% market share (monopoly) in gas distribution, controlled by the govt. 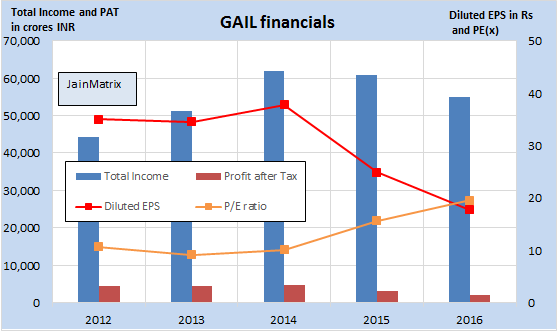 The current dividend yield for GAIL stands at 1.48%. The RoCE stands at 9.57% and RoE at 9.24%. This is average performance. The firm’s performance was poor because of long term contractual agreements. Under an agreement GAIL is liable to take 60% of Petronet LNG’s procurement which was sourced from Qatar based company RasGas. Based on the contract signed between the Petronet LNG and RasGas in 1999, Petronet LNG was getting LNG at $12-13 per mBtu (million British thermal unit) in FY16 whereas the spot gas prices had fallen to $7 per mBtu, leading to GAIL India suffering losses. However the contract terms were renegotiated in FY16, under which the price for the buyer would be governed by market dynamics based on a crude price linked formula. So GAIL is expected to perform better in FY17 with reasonable costs, good demand and high utilization of pipelines. MGL has paid a dividend of Rs 17.5/ share in the previous 3 years, which gives a yield of 4.1%. As per the MoPNG guidelines, MGL has access to cost effective domestic natural gas equal to 110% of their CNG and domestic PNG requirements (such customers are “Priority Sector”). The domestic natural gas is currently sold to them at US$ 3.06/ mmbtu (GCV), which is lower than the price of imported natural gas, for supply exclusively to the Priority Sector. These sales accounted for 84.1%, 85.0% and 85.6% of MGL total sales volume in FY14, FY15 and FY16, resp. For industrial and commercial PNG consumers, they source regasified liquefied natural gas both on term and spot basis. The selling price of natural gas is not regulated and thus they generally are able to pass on an increase in the cost to customers. The price at which MGL sells natural gas is benchmarked to the price of alternate fuels as petrol, diesel, other liquid fuel and LPG, which are in turn linked to crude oil. MGL is given pricing flexibility based on procurement costs for both CNG and PNG. However CNG prices are regulated. It means that MGL is allowed to change the price, but govt. can intervene for the price of CNG, but not PNG. The price of domestic natural gas allocated by the MoPNG is determined as per the Pricing Guidelines, this is the administered price mechanism (APM). The price of natural gas is presently US$ 3.06/MMBTU on GCV basis, this price is much lower than the price of imported natural gas. MGL launched its mobile application ‘MGL Connect’ for its PNG and CNG customers. The mobile application featured various consumer friendly features and services. In 2014 there was a Gas leak in MGL’s pipeline in Mumbai’s Worli area. The measures were taken at the right time and a major mishap was averted. A ban on >2000 cc diesel engine car sales in New Delhi is meant to help clean the environment. It was imposed by the NGT (National Green Tribunal) in Dec 2015. This may soon be extended to other cities and regions in the country. It emphasizes the importance of natural gas as a clean fuel in India. New Delhi was the first to enforce CNG as fuel for all bus services, helping clean the air. We expect this to be rolled out in all major cities over time. Growth driver – MGL has commenced project activities in Raigad district to lay pipeline infrastructure. The Raigad district provides good opportunities for expansion of their networks. On 21st June, the Day 1 of IPO, the issue was subscribed 110% by 5pm, indicating a good demand. MGL collected Rs 309 crore from anchor investors, a day ahead of its IPO, by raised money from over 20 anchor investors, by selling shares at Rs 421 apiece – the higher end of the price range. The unofficial/ grey market premium for this IPO is in the range of Rs 100 – 102. Natural gas production in FY14 was 97 mmscmd by ONGC, OIL, non-state owned and JV companies. This however constitutes only about 26% of India’s gas consumption. The Indian CGD market size was estimated at INR 24,000 cr. in FY14, with sales volumes of 20 mmscmd, accounting for 13% of India’s total natural gas consumption. The PNGRB has envisaged a rollout plan of CGD network development through competitive bidding in more than 300 Geographical Areas (GA) in a phased manner. The actual rollout has been delayed due to lack of connectivity and supply constraints, with the Govt. needing to assure domestic gas supplies for CGD entities (CNG and domestic PNG). The PNGRB has bid out 34 GAs in the sixth round of CGD bidding. 106 GAs have been identified by PNGRB for subsequent bidding subject to natural gas pipeline connectivity. PNGRB’s bidding rounds could be a large opportunity for growth with 11 GAs in Maharashtra and 60 GAs in rest-of-India offering multiple opportunities to MGL for expansion beyond Mumbai. By the end of FY14, India had a natural gas pipeline network length of 14,988 km with capacity of 401 mmscmd spread over 15 states and UTs. GAIL as a leading player owns 73% of the network. CRISIL Research expects CGD sales volumes to rise from 20 mmscmd in FY14 to 22.4 mmscmd in FY17. Volumes of both industrial and commercial segments have declined over the last 2 years. But volumes are expected to increase from 2015-16 and grow at approximately 6%, led by fleet additions to public transport, private vehicle conversions and rising economic activity. Natural gas demand for CGD sector is expected to rise steadily due to the growth of gas networks in new cities, price advantage of CNG and increased use of PNG in domestic, industrial and commercial sectors. The Govt. plans to set up 15,000 kms of new gas pipelines would aid CGD usage in newer areas. The last 2 years saw a sharp fall in prices of crude oil and natural gas, caused by both a supply glut and a fall in global growth. India however is a beneficiary as it is a major importer of natural gas. Mumbai has a population of 20.7 mn with 5 mn households and 6.7 mn motor vehicles. MGL serves only 0.47 mn vehicle and 0.86 mn domestic users. Thus the penetration stands at 7.01% (0.47/6.7) for motor vehicles and 17.2% (0.86/5) for domestic users. MGL’s revenue, EBITDA and PAT has grown 12.42%, 1.76% and 0.08% CAGR over the last 5 years. The revenue and EPS growth (Fig 5) were flat for FY15 and FY16 as CGD companies faced cost pressures and a fall in margins. MGL supplied 1.95 mmscmd of natural gas in FY12 which rose to 2.43 mmscmd for FY16, registering a CAGR of 5.67%. Thus over the years, MGL had increasing revenues and volumes, however there was almost no PAT growth because of rising input costs. The operating margin fell from 39% (2012) to 26.9% (2016). The net profit margin also fell from 23.17% (2012) to 14.55% (2016). But margins are likely to be stable from now on. 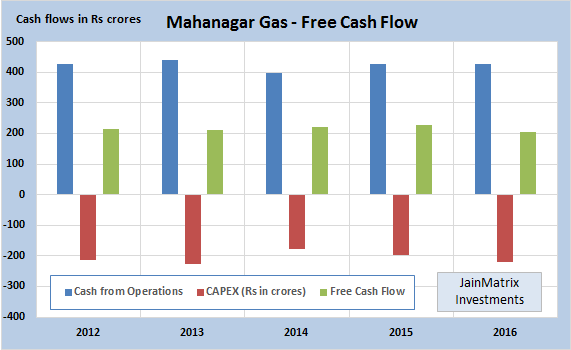 MGL has been able to generate Free Cash Flow over the last 5 years, a big positive. Fig 6. MGL has a ROE of 20.2% (FY16) and RoCE of 22.0% (FY15). These are healthy return ratios. The cash per share including Reserves & Surplus and Cash in Balance sheet is Rs 163/share. This indicates that the current operations of MGL are available at (421-163) = Rs 258/share. We have benchmarked MGL against peer gas companies like Indraprastha Gas, Gujarat Gas, etc. MGL appears to be available at reasonable valuations. The low D/E is a positive. Dividend yield is the highest. The balance sheet is strong and can be leveraged for future business needs. Margins are in the fair range. But MGL has good ROE (20% +) even with low margins. Margins are expected to improve from now on and volumes would also be higher. Thus return ratios are good. The IPO pricing is attractive. At the upper band of Rs 421/share, MGL’s asking price P/E is 13.47 times which is lower than its peer Indraprastha Gas Ltd. (19.55 times). The CGD industry is at a turning point with a renewed focus on cleaner environment and lower costs of gas versus competing fuels which is likely to push volumes. Green efforts and NGT rulings will push transportation towards CNG as fuel. This is likely to benefit MGL. MGL is a debt free, with strong balance sheet, cash balance and high return ratios (RoCE and RoE). MGL has the exclusive rights for gas pipelines & sales in Mumbai (2020 limit), Raigad (2040) and Thane (2030). There is ample potential for MGL to grow in these regions. The promoters of British Gas/ Shell can provide technology and commercial expertise for growth. Piped gas supply by MGL is superior to the cylinder based LPG supply by state owned oil marketing firms. As soon as MGL sets up a network in an area, most consumers will switch. The price of domestic natural gas and RLNG purchased by MGL is USD denominated while the selling price is in INR. The currency risks have to be absorbed by MGL and its customers. Transporting natural gas is hazardous and there can be accidents caused by floods, other utility company activities, road accidents, etc. These could adversely affect their reputation and business. Smooth relations between the equal shareholder promoters is important for MGL. MGL has a monopoly on Mumbai region gas pipelines and supply till 2020. It must rapidly set up a high quality network in this period to ensure it continues to dominate the gas business thereafter. MGL will not have any gains from this IPO, and the proceeds will go to the promoters only. MGL’s gas supply is met by the allocation by the MoPNG at prices in accordance with the Gas Pricing Guidelines. Any increase in the cost price or reduction in allocation will adversely affect business. MGL’s natural gas marketing exclusivity in Mumbai and adjoining areas has not been dealt with by PNGRB. The subject is subjudice in the Delhi High court for a case involving IGL. Their request to PNGRB to retain marketing exclusivity in Delhi was rejected, and which was in turn taken to Delhi HC. The Delhi HC verdict is pending on the issue. An unfavourable ruling would mean that CGD firms will have to distribute other competing companies’ gas through their own pipeline. MGL may be restricted in its operation to the Mumbai/ Thane/ Raigad areas, and hence may not be allowed to continue to grow into a national player. Thus after a point, MGL growth may be limited. The growth of renewables has been very rapid, encouraged by GoI. These are superior to fossil fuels but require a higher capex. After a few decades, gas may become a backup fuel source. However gas sector will continue to grow for 10-20 years as it is cleaner and superior to other fossil fuels. Gas as a source of energy is superior to other fossil fuels. In energy hungry India, it will continue to grow as a fuel source. With the recent fall in prices, we see an upswing in demand. MGL operates in a regional monopoly and has ample scope to grow in Mumbai & surrounding areas. The recent financials of MGL were stressed by higher cost of gas. However measures have been taken and costs have stabilized for MGL. The outlook now is much superior for MGL. Inspite of this stress, MGL has a good balance sheet, no debt, high cash and a good dividend yield. In a sector dominated by PSUs, MGL brings in a high level of governance, vision and shareholder friendliness. It is available at attractive valuations. Based on the adjusted FY16 EPS, the asking PE stands at 13.47 which is lower than listed peers. MGL is not just a piping hot IPO, but also A Hot Piping IPO. Hence, MGL is a BUY with a 2 year perspective. This document has been prepared by JainMatrix Investments Bangalore (JM), and is meant for use by the recipient only as information and is not for circulation. This document is not to be reported or copied or made available to others without prior permission of JM. It should not be considered or taken as an offer to sell or a solicitation to buy or sell any security. The information contained in this report has been obtained from sources that are considered to be reliable. However, JM has not independently verified the accuracy or completeness of the same. 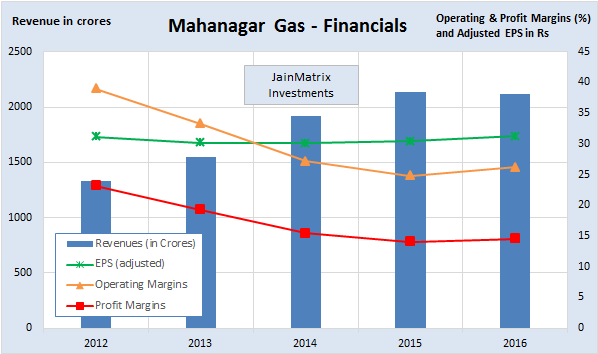 JM has no known financial interests in Mahanagar Gas Ltd. or any related group. Neither JM nor any of its affiliates, its directors or its employees accepts any responsibility of whatsoever nature for the information, statements and opinion given, made available or expressed herein or for any omission therein. Recipients of this report should be aware that past performance is not necessarily a guide to future performance and value of investments can go down as well. The suitability or otherwise of any investments will depend upon the recipient’s particular circumstances and, in case of doubt, advice should be sought from an Investment Advisor. Punit Jain is a registered Research Analyst (SEBI Registration No. INH200002747) under SEBI (Research Analysts) Regulations, 2014. JM has been publishing equity research reports since Nov 2012. Any questions should be directed to the director of JainMatrix Investments at punit.jain@jainmatrix.com.